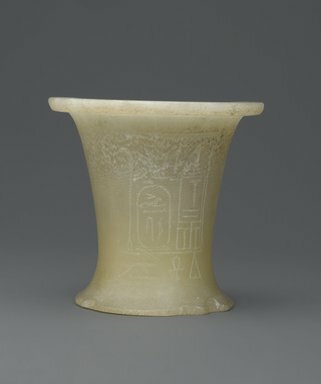 One cylindrical alabaster vessel with flat top. Flaring rim and base. Inscribed for the Horus Wadj-tawy the Nsw-bity, Unas. Condition: The rear of the vessel is completely broken off—almost down to the bottom. Front edge of the foot is much chipped.